tassie wrote: I have not received an email in response to this query. This ticket number is not listed in my Member Services. Could you please PM me your mobile number for me to investigate whether the email was indeed sent to the correct recipient. Apologize for any inconvenience and if you have not received the email, I will ensure a quick response to your query once you PM me your service number. Thushari wrote: tassie wrote:I have not received an email in response to this query. This ticket number is not listed in my Member Services. I have sent you an email to your nominated email address with the email ticket reference 4397718. Could you please reply to same if you have further queries. On the Mobile Phone Meter page, the line "There is data usages for 04xxxxxxxx" has a consfusing pluralisation. If it was "There is data usage for..." it would be better. My usage meter is showing the month has just started? Since your billing date is on 28th of the month, usage meter also starts the count on the same date. I think the question was since when there is a 32 day month? My usage meter is showing the same error. Not sure if this has been reported. I found that the Total Optus IP on Exetel National / State Bandwidth Summary http://public.mrtg.exetel.com.au/bwsumm ... mmary.html hasn't been updated since October, 2011. 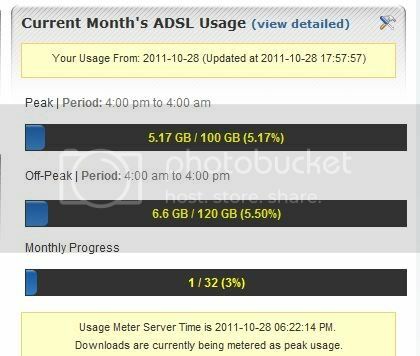 If you click on the Total Optus IP graph, it goes to http://public.mrtg.exetel.com.au/bwsumm ... us-ip.html. The page shows it was last updated on Tuesday, 4 October 2011 at 16:22. Also, the capacity for VIC Optus on this page is 400Mbps only while the "Internet Access via Optus" on the network diagram http://www.exetel.com.au/files/exetel_network.pdf shows it is 900Mbps. Which one is correct? All other statistics are up-to-date. I have just applied to change my current naked plan to a current full service plan. The current (naked) plan price on the application screen was incorrect (please see attachment). While not an issue per se it did confuse me such that I cancelled the application to confirm my plan price on my last invoice. I wanted to make sure I wasn't applying for something more expensive. Current plan is $43 per month but screen showed $23 per month. Screen was entered via Manage Services > Change service > Apply button. The attachment shows the screen reached at this point. Jyrn wrote: I have just applied to change my current naked plan to a current full service plan. The current (naked) plan price on the application screen was incorrect (please see attachment). While not an issue per se it did confuse me such that I cancelled the application to confirm my plan price on my last invoice. I wanted to make sure I wasn't applying for something more expensive. Thank you for letting us know. We will have this rectified as soon as possible. This has been rectified by correcting the details on the Members Facilities. Just a thought, hope that made sense.